Or actually In the Eyes of Madness. After all, it's a movie, not a BigMac. Inspired by the life and works of Stephen King (with a pinch of H.P. Lovecraft) the film is not an adaptation of his works, but more of a parody of his career. King has invented vast universes populated by myriads of characters that we feel we have gotten to know personally, through reading about them. As there are very few of us who know Stephen King personally and most have only read a short notice about him on the back covers of the thick books his characters inhabit, it is as if his fictional characters appear more real to us, than the actual man who invented them. 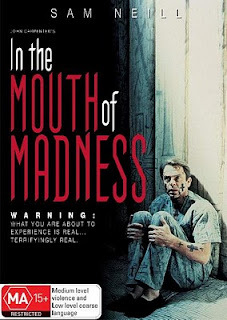 And it is this idea of fiction seeping into the world of fact, that is the subject of In the Mouth of Madness. If seeing is believing, and believing is seeing, then how can we be sure that the images we see in our mind, does not exist in the real world? And what if what we see in our mind does appear in our life, right before our eyes? Surely that is a sure sign of madness. Directed by John Carpenter, In the Mouth of Madness is a horror classic you'd be absolutely crazy to miss.